Kittens do not have fully developed immune systems, so we place all felines under the age of six months in foster homes. This helps protect them from diseases other animals may bring in. It also enables us to monitor their health and ensure we can provide any necessary medical treatment before they go into a new home. In a foster home, they receive the socialization and love they need to flourish. 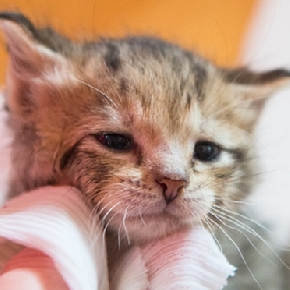 The duration of the foster period is typically about two weeks. Nonclumping litter: Clumping litter may be dangerous if ingested by a kitten. Food bowls: You will need two bowls—one for wet food and one for dry food. The more cats you have, the more bowls you will need. It’s important that every cat has access to his food at all times, unless directed by our medical staff. Water bowl: Use ceramic, porcelain or stainless steel bowls, which are heavy and impossible to tip. Do not use plastic; it is difficult to disinfect. It’s also important that every cat has access to clean water at all times. Bedding: Old towels make the best bedding! We suggest making a nice, warm sleeping area by using a cat carrier or tipped over box. Toys: Disposable and easily sanitized toys are a must! We also encourage cardboard scratchers or a scratching post. You will need to keep your foster cat in one room. The foster room is where your foster will eat, drink, eliminate, sleep and play. Choose a room in your home that can be easily temperature controlled (no drafts or open windows). We highly recommend that this room have floors that are easy to wipe up and mop. Bathrooms are often the best choice—just don’t forget to put down the toilet seat! In the room, place the litter box as far away from your cat’s food as possible. Kittens are curious, playful and often mischievous. Don’t leave anything out that your foster pet can chew, swallow or break (electrical cords, hair ties, glassware, etc.). Look for places where your foster can hide and be sure to block access to those areas. Keep your foster kitten isolated from any other animals in the home unless otherwise discussed. It is crucial that you monitor your foster cat’s appetite, attitude, energy level and appearance every day. We encourage our foster parents to keep a log. If something seems off or different, it’s easy to go back and pinpoint when the problem began. We ask that you weigh your kitten at the same time each day and keep track of any gains or losses. Ideally, kittens gain 0.25-0.5 oz. per day. If your kitten is not eating or is losing weight, please contact our foster team right away. We will likely need you to bring your kitten in immediately for a medical check. Kittens should be fed at least twice daily. Please feed your foster kitten the food we have provided. If he refuses to eat his food, please contact us. We will help you determine your next steps. Wash his wet food dish between servings. Scoop the litter box in the morning and evening. Clay litter should be changed every other day for two kittens or daily for two or more kittens or if the kittens have diarrhea. Note stool consistency. All foster cats crave playtime. We recommend two play sessions per day with interactive toys like wand toys. Discourage play with hands, which can lead to bites. Change your foster’s environment daily by adding new objects and toys. Please visit your foster at least two to three times a day for at least 20 minutes per visit. 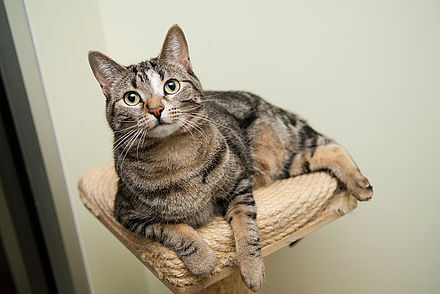 Encourage affectionate behavior with food treats or play sessions. Kittens should meet new people as often as possible. Kittens will need routine visits with our veterinarians regardless of their health. They need to be vaccinated every two weeks. Please check with your foster coordinator to find out when they need to be brought in for their next vaccine.